What floated my boat in 2014? Some old, some new, all delicious! Happy New Year all! I hope you have nice plans for tomorrow night. And that 2015 starts off with a bang and lots of promise. 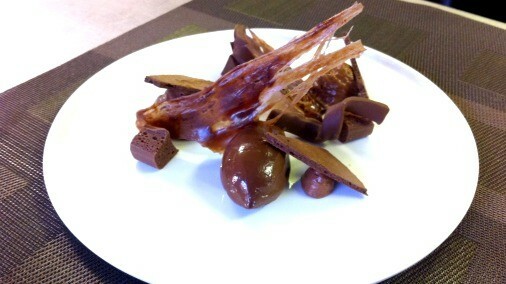 Damian Allsop’s Salt Water Ganaches. 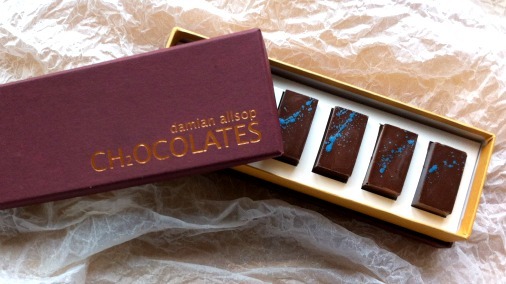 Best Dark Chocolate: Genius chocolatier Damian Allsop is now flourishing in his new home in Gerona. He has taken his water ganache one step further to create these sea water ganaches. He is using Pacari Piura, the International Chocolate Awards best dark bar in the world 2013. The result is as astoundingly pure, delicate, but full-flavoured treat. It starts with gentle citrus notes, then redcurrant with a herbal hint like tarragon, the salt rounds the flavours making it full and alive, but the whole remains something subtle finishing in the very fine chocolatey notes of the prize winning cacao. Special. Friis Holm 65% dark milk chocolate. 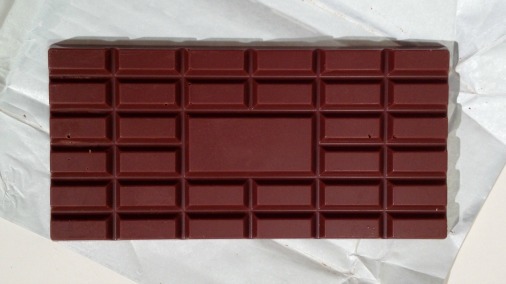 Best Milk Chocolate: My long time favourite milk chocolate is Friis Holm’s 55% Dark Milk. This year the 65% of the same cacao has pulled ahead by a whisper, delivering a chocolate rich in caramel notes. A joy to eat. Original Beans Edel Weiss 40% white chocolate. Best White Chocolate: A bit of a game changer for me this one. This is the first white chocolate bar I can get excited about. 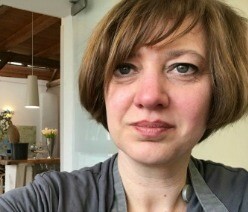 Up to now I have been impressed by what chocolatiers and chefs have been doing with white chocolate. 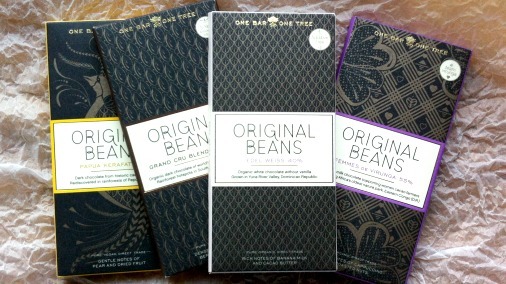 This new release from Original Beans is, dare I say it, worth eating unadorned! Less sweet than the norm, with no vanilla, this is creamy, with gentle caramel, and the best white chocolate I have ever encountered. Pump Street Bakery’s Sourdough & Sea Salt. Best Flavour Combination: Sourdough & Sea Salt from Pump Street Bakery makes the most out of very fine cacao and the complimentary tang of the award winning bread they also make. Both naturally fermented, both superb artisan products, their bread and chocolate are instinctively right for each other and combine into a very lovely thing indeed. I can’t get enough of this new bar. Pump Street Bakery are a very exciting one to watch. Best New Discovery: See above! 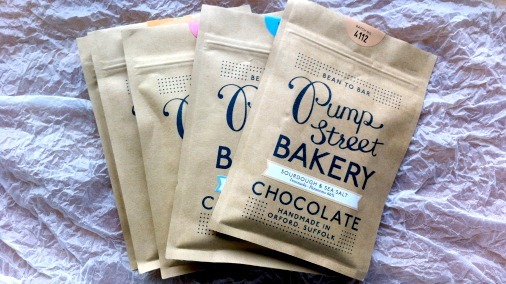 Pump Street Bakery are doing things right and consequently growing into one of the most exciting new chocolate makers around. I can’t wait to see and taste more in 2015. The view from the terrace of the Palazzo Gaddi Astoria, venue of the ICA European semis. Best Event: The International Chocolate Awards has just finished it’s third year, bigger, better, with more entrants, more regional heats, and more informed judging categories and criteria. It was an honour and a joy to be on the Grand Jury. 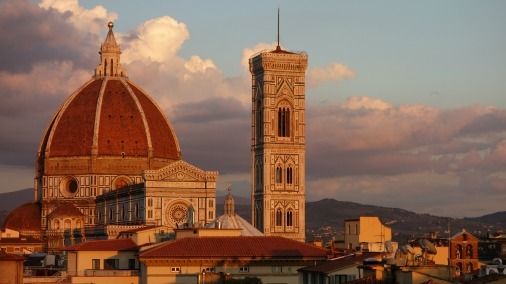 My personal highlight was judging the European Semi-Finals in Florence, Italy. Thanks to Italian partner Monica Meschini we were in the beautiful halls of the Palazzo Gaddi, gazing up at frescoes of chubby putti as we judged, and able to wander the streets of this beguiling city in between times. The results of the world finals are now live online. 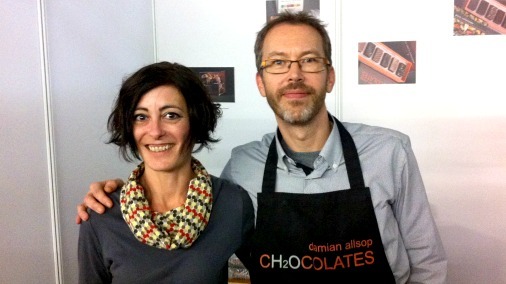 Damian & Anna, from Damian Allsop Chocolates. Best Chocolatier: Damian Allsop has not only found his feet since his move to Gerona in Spain, but he has hit the ground running. His signature collections are better than ever, his new sea water ganaches are one of my top picks of the year, and I am LONGING to get myself out to Gerona to eat at his new cocoa inspired restaurant Mimo Damian. Nice work Damian! 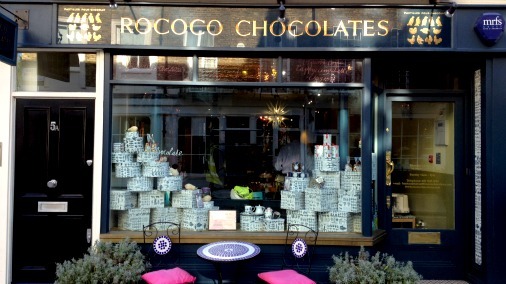 Rococo Chocolates Motcomb Street boutique. 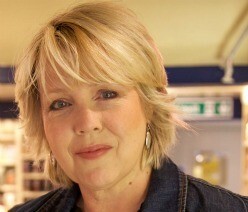 Best Venue: Chantal Coady has been awarded an OBE for chocolate! Rococo has been going for 30 years! And still, reinvention and a determination for both excellence and ethics make Rococo unquestionably one of the best possible places to visit for fine chocolate in the UK. At their new Moxon Street store they host great classes and pairing events, Motcomb Street’s cafe is one of the most charming and delicious places for hot chocolate in London. Altogether, the chocolate landscape would be a very different, and much poorer, place without Rococo to visit and Chantal to guide us. 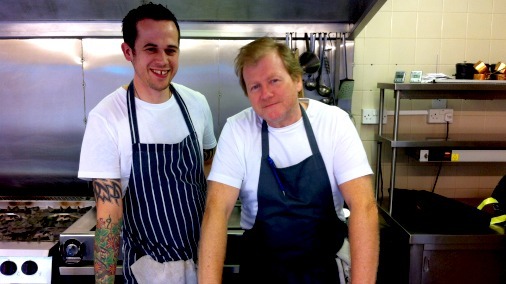 Graham Garrett and Ben Crittenden, putting the finest chocolate on The West House menu. Best Chocolate Dessert: The dessert itself is the lead picture for this piece, the chef Graham Garrett of The West House (shown above with righthand-man Ben on the left). I have been thrilled by the increased interest in fine chocolate and it’s potential as an ingredient that I have met this year. Graham Garrett leads the pack in this respect. The dessert shown here was him pushing that knowledge to it’s limit, playing with chocolate, testing all he could do with it. It was an ultimate chocolate-fest, texture, intensity, temperature, all showcasing some very fine couverture from Valrhona and Original Beans. Heavenly! I know that Graham, forever experimenting, is now creating new dishes that I cannot wait to taste and I’ll keep you posted. But I loved this chocolate plate, for it’s exuberance, and all that chocolate! La Maison du Chocolat, the Salle à Marbres. Best Experience: This year has been full of fabulous tastes and experiences, but if I have to choose one I would say that it is hard to beat one particular two day visit to Paris. 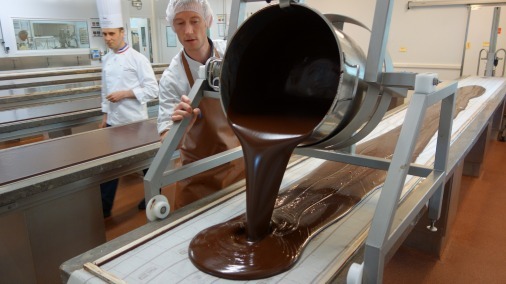 The first day I spent with Nicolas Cloiseau, Head Chocolatier of La Maison du Chocolat at their workshops in Nanterre. 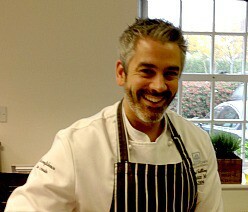 Their operation, their recipes, Nicolas himself, were all absolutely delightful and exceeded all possible expectations. I have already posted my report of that incredible day. The following day I spent the afternoon with Philippe Conticini of Patisserie des Reves, another extraordinary man, running an amazing business, whose story and patisserie moved me deeply. The report from that second day in Paris will be posted shortly. On that note, lots to look forward to, lots to look back on, but for the present have a great New Year’s Eve!